I never saw a day go by so fast in my entire life. Oh well, I had fun putting together this quilt top, starting with a set of old star blocks from....the 40s or thereabouts. They were hand-stitched and carefree in their dimensions and wavy in their flying geesies, so it was quite the project forcing them into the prescribed 7-3/4" finished block size :-). I decided to ignore their time period and set them with a Carrie's Madders from Blue Hill (c.1870), then added a border from Steamer Trunk Treasures (c.1840), added a narrow border from Paula Barnes' French Quarter (I guess also c.1840?) and finally a wide border from Windham's Hearthstone (Winterthur pattern). I only had a bit of the French Quarter, so was piecing it every 15 inches. The light-colored blocks are seersucker and the orange ones have bright thread detail woven in. Now isn't this the dearest little box? It was made by a lady in Ohio and I got it at an excellent shop of all-American-made crafts in Old Norcross called Abbygayle's. I wish I had gotten a picture of the shop owner; she was great and has a great look. So does her shop: it is in a tiny cottage with a few tiny rooms minimally furnished with good stuff like the pincushion with the standing mouse on it, homey linens, folk dolls, etc. well you certainly pulled the fabrics together to make that all work. Such interesting fabrics too. It is quite a charming quilt! Wow! That is a knock-your-socks-off great quilt!! Love all the fabrics. You are a master at combining colors & patterns. Love all those fabrics in your quilt. That is quite a beauty! Thank you for sharing the name of the shop with All American made goodies. I love those kinds of shops. My husband and I are doing our very best to support our own country in our purchases. I have the Settler's Pride pattern too and the plan is to get started on it this fall. I just love Maggie's patterns. I didn't get "that feeling" so I guess that is why I didn't win. LOL! 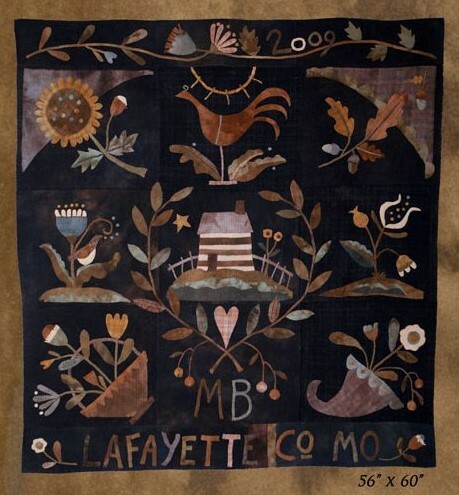 The fabrics in the little quilt seem to look like the same period of time even if you say they aren't. All play together well. I love, LOVE your quilt! That little pin cushion is awfully darn cute! WOW! What's not to love about your quilt!!?? I adore the colors and prints you chose to set your vintage blocks. The whole quilt looks vintage now!! Love your adorable box!! Congrats on the pattern win. I've admired that one for a long time too. That is an outstanding quilt! You did good!! Is that outer border zig zag pieced or is it a printed fabric? I really love the shaded colors. Thanks for the inspiration! Love the border fabrics you've chosen, everything blends in so well. Congrats on the win of the Settler's Pride pattern. 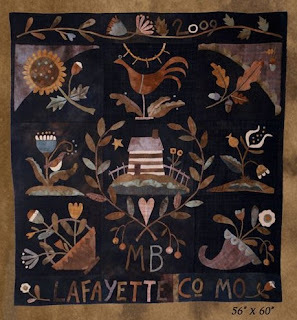 I've seen this quilt made up and it is gorgeous. Cute little box, the embroidered top is so sweet. What a beautiful Quilt Karen. And the box is awesome!